The key challenge might be imagining where new technologies can take you, according to McAfee, who is Co-Founder and Co-Director of the Initiative on the Digital Economy and a Principal Research Scientist at the MIT Sloan School of Management. 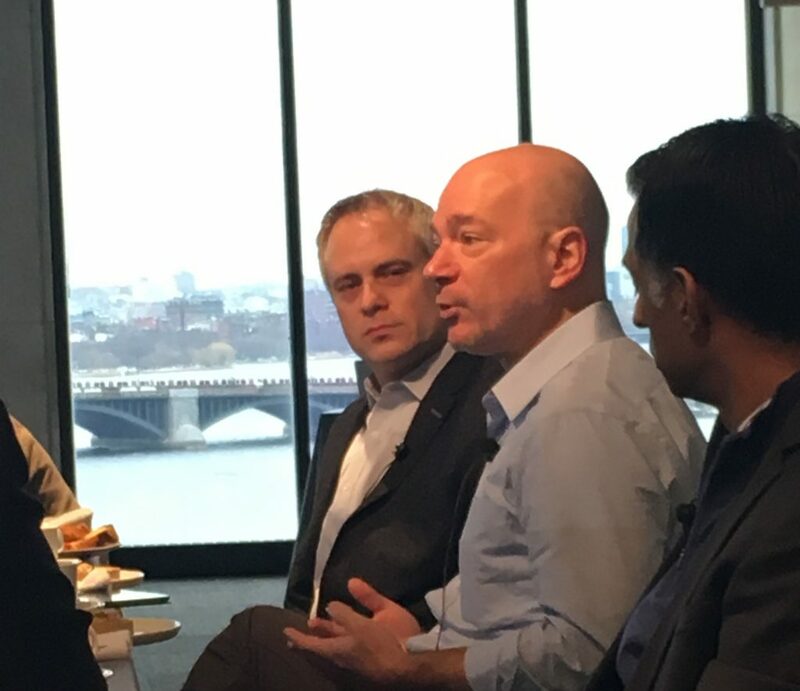 He joined Bloomberg Technology Senior Executive Editor Brad Stone and Bloomberg Intelligence Senior Technology Analyst Anand Srinivasan for a data-rich conversation that centered on how companies and individuals are riding the waves of technological change that are dramatically reshaping business and culture. 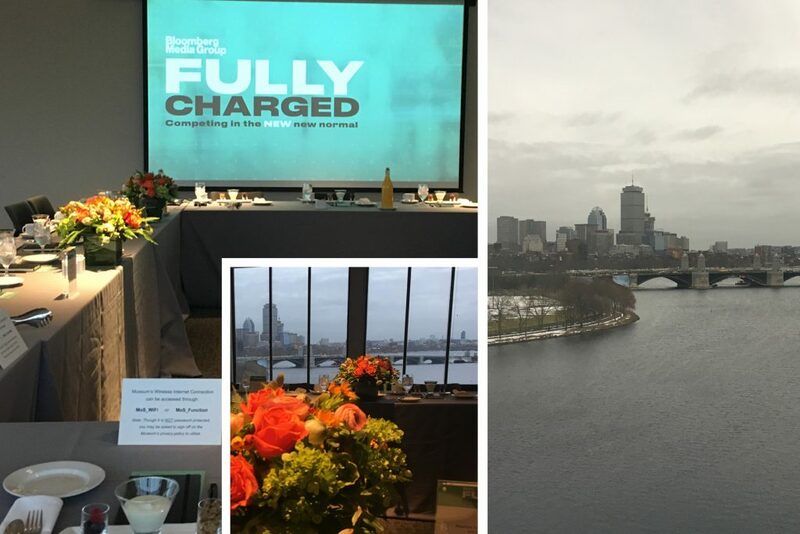 Held at the Museum of Science, the event was the second in a continuing series of Fully Charged breakfasts (the first took place in San Francisco) for marketing executives and leaders who are focused on what the future holds. 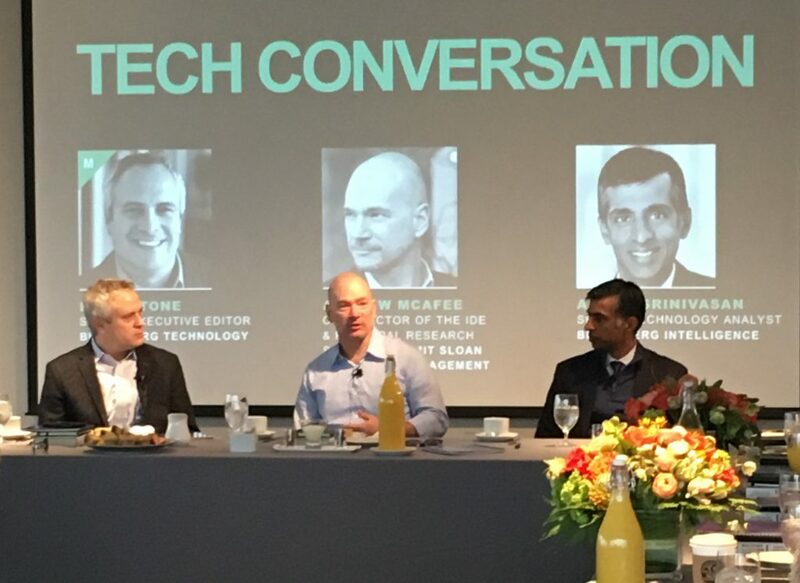 Highlights of the conversation were also featured on Bloomberg Radio’s Boston area stations and on Bloomberg.com. Bloomberg Intelligence’s Srinivasan began the morning with a data briefing on key trends from Artificial Intelligence to self-driving cars. AI, he said, is growing at a pace that significantly outstrips other high-growth tech segments including cloud, big data and security. “AI is a seismic trend,” he said. “It’s going to affect us all.” And it’s imperative that companies figure out how it’s going to impact their industry. Srinivasan added that the technologies that come into play along the way are as important to pay attention to as what the future might hold. “Focus on the journey as much as the destination,” he said, “because fantastic things are happening now.” For example, he said, fully driverless cars may one day create a vastly different transportation system – but right now, car technologies such as blind spot detection, collision warning and parking assistance are already greatly enhancing how we get from point A to point B.
McAfee expanded on that point in conversation with Stone and Srinivasan. He cited numerous examples where successive waves of technologies each presented a what felt like a new paradigm at the time – for example, the way downloading songs for 99 cents each gave way to streaming as many songs as you can listen to for $10 a month. Each wave represents new disruption, and there is plenty more to come as new inventors see new opportunities. “There are massive inefficiencies in our economy all day, every day – and now that we all have computing technology in our pockets, that’s going to change very quickly,” he said. Some high-dollar transactions, for example – like buying a car or selecting insurance – are transitioning away from a high-touch, human-centric sales process as digital platforms establish experiences that feel streamlined, trustworthy and enjoyable. Moreover, no sector of business is immune from disruption. “I have trouble thinking of a single industry where I don’t see entrepreneurs going after big, sleepy incumbents,” McAfee said. “No one has a moat.” Even highly regulated industries such as finance will face competition from startups that offer customers a different set of products aligned with new experiences allowed by technology. When it comes to news media, Bloomberg’s Stone sees room for optimism as publishers experiment with new formats and partnerships that create just such products. He pointed to the recently launched global news network TicToc by Bloomberg – which is the first and only such network built for Twitter – as an example. McAfee added: “We are all consuming more news than we were 10 to 20 years ago. For customers, it’s more not less.” Social media platforms have clearly had a profound impact on the media industry, and there’s likely more disruption to come, he noted. But the recent explosion of podcasting, he said, indicates there is still a healthy appetite for long-form, thoughtful, intelligent journalism alongside the fast, distilled information bites found on platforms. With tech-fueled change happening across the business landscape, of course, new products may have unintended effects. Facebook, said McAfee, has become immensely profitable by offering a powerful self-service product to advertisers – but that’s also created opportunities for bad actors, as recent headline news illustrates. Risk – and even how people perceive risk based on news coverage (a phenomenon known as “headline risk”) – plays a role in the process of how technology develops, McAfee noted. So do human consequences such as job loss or stagnation. And as Bloomberg’s Srinivasan pointed out, there’s a growing focus on the ethics of AI as well as increasing attention from regulators. And against that backdrop, Stone added, the next decade will bring 100 times the computing power we have now. Hold onto your hats.